Property 32: Entreviñedos del Somontano, ideal for families and groups of friends with pool! 'La Cruz' family room in a grand old Aragónese farmhouse (sleeps<4). Property 39: 'La Cruz' family room in a grand old Aragónese farmhouse (sleeps<4). Property 41: The Juanico Era. 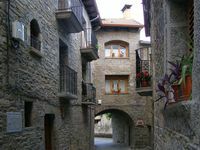 Casa Tozal de Guara. Property 42: Rural House La Era Juanico in Estadilla. Casa Cotiella 5 people. We had a lovely holiday in a part of the Spanish Pyrenees we had never visited before. We found this great cottage and it was located in remote valley, which was the perfect base to explore the area. The cottage is off-grid so that was nice and made the trip a lot more special.